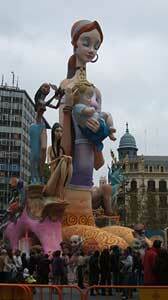 This is the only falla not commissioned by a Falla-Community: it is the Mayor's contribution to the Fallas festival. 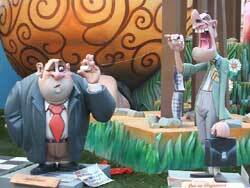 Strictly speaking it is not a Falla Especial since it does not participate in the contest for the first prize. 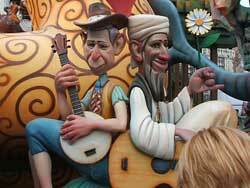 But it is the central point for Las Fallas festival, so it is very special after all - the official face of the Fallas of Valencia. This is where most visitors watch the crema (the burning). 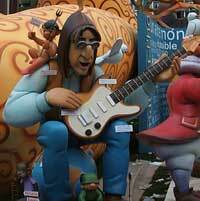 This 2006 Falla "Imagine" is inspired by John Lennon's song. 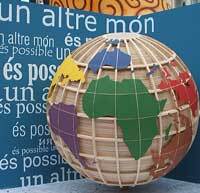 A mother rocks her child, imagining another, better world for him. 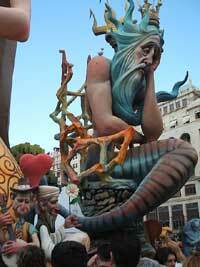 Quickly, though, the falla goes off track in many places, imagining obscure wacky things, quite entertaining. The Man himself George? Ringo? Poseidon wishes we didn't pollute waters of the planet. Erm..not sure...perhaps imagine everyone had a pair like this?